It's been said that history is written by the victors, but these days history is re-written by the movies made of historical events. Who doesn't imagine characters of the past by the actors who portrayed them in films? Everyone should also know by now that you can't always judge what you see on the big screen or TV as being the whole truth. Like there wasn't really Lord of the Rings fighting trees in Noah's time, right? Anyway, the controversy over the Internet lately regarding some inaccuracies of the script by Paul Webb and re-written by director Ava DuVernay should not distract from the excellence in the storytelling of a timely and important subject. Considering the nasty head of racism that still exists, we need a reminder of the efforts made by Dr. Martin Luther King, Jr. to inspire us all. 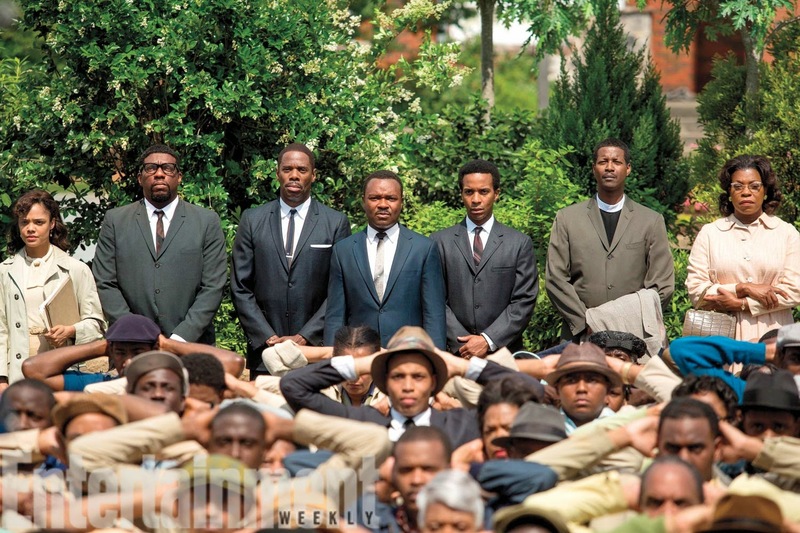 The story centers on the events of Dr. King (David Oyelowo) during the 1965 Selma to Montgomery voting rights marches. The brutal art of politics and compromise comes into play as MLK tries to convince President Lyndon B. Johnson (Tom Wilkinson) to push a voting rights law. While LBJ tells him to wait while he as other agendas on his plate like not ruffling the feathers of segregationist governor George Wallace (Tim Roth). J. Edgar Hoover (Dylan Baker) offers LBJ a plan to discredit MLK, bugging his offices and homes and upset his marriage to Coretta Scott King (Carmen Ejogo) with mysterious phone calls revealing MLK's extramarital affairs. The violence of the times are featured head on as in the bombing that killed young children in a church, the brutal beating received by the marchers in Selma, the thuggish police and officials who are quick to lay down the law as they see fit. The comparisons to the events in Ferguson are inevitable. The background for the events are laid out and filled with information that sets up the obstacles that must be endured and overcome. Punctuated by MLK speeches and his angst at the leader and the hope of the times, Oyelowo captures the essence of MLK with a dignified calm and intensity. He inspires his followers, reassures his wife, teaches the radicals that want to fight back the only way is for a peaceful protest. All the while he suffers from doubt and insecurity, struggling with the guilt of seeing the marchers getting beaten for their actions. Despite the articles on the inaccuracies of historical fact, the movie is still important and inspirational. So many young people today are unaware of these events that shaped our country just a few short decades in the past. It reminds us of how far we have come as human beings and that racist mindset should be eliminated from our society for us to survive.